Allagash Hugh Malone, Allagash Mattina Rossa, Allagash Black, Geary's Autumn Ale, Atlantic Brewing Porter, Sea Dog Blueberry, Maine Mead Works HoneyMaker, Shipyard Pumpkinhead, Shipyard Blue Fin Stout, Shipyard Old Thumper E.S.B., and Shipyard XXXX IPA (Pugsley's Signature Series). I also had a Stella Artois just for a little retro fun. Today, however, I got home and I put on my cooking shoes. 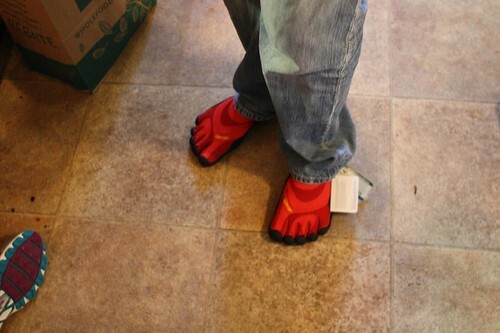 Jen's always trying to get me to wear these silly shoes and I found them to really get me back into the cooking game. Mostly all I did today was spend the day peeling, chopping, and roasting vegetables in preparation for tomorrow's Canadian Thanksgiving celebration. I took advantage of this idle time sitting on the couch to watch a double feature of Animalympics and The Matrix, two Canadian Thanksgiving themed movies. 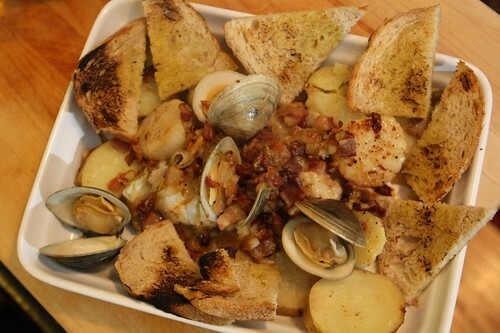 I took a quick break to make a Maine-inspired seafood dinner based on some awesome mussels I had in Portland. I rendered a little bacon with olive oil then tossed in some crushed garlic and sliced shallots. After they'd cooked down a bit I seared a piece of cod, some sea scallops, and tossed int some littlenecks. I seasoned them with only salt and pepper but sprinkled some Old Bay over the top when it was all done. I also baked a potato, sliced it, and tossed it into the pan. Then I grilled some slices of bread and rubbed them with a garlic clove. I would have liked to add a little white wine and some seafood broth to this but we didn't have either ingredient handy. This dish is super easy to make (took about ten minutes from start to finish) and I would highly recommend doing this with the two missing ingredients mentioned above. It couldn't hurt to also add some fresh herbs. 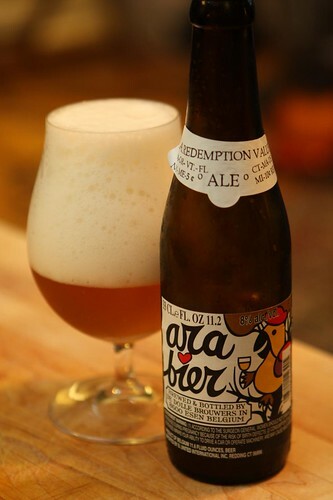 To pair with this I poured an Arabier from Brouwerij De Dolle Brouwers. This was the headiest beer I've ever had and I really wasn't able to start drinking it until after dinner. It was much more hoppy than the parrot on the label would have lead me to believe. After dinner we heard a knocking at the door. My favorite UPS driver was there holding a box. He said, "I think this is grape juice." Then he looked at the label and nodded. "Yup. Grape juice." It turned out to be the wine we'd ordered on our expensive stop in Beaune, France this summer. As expected it was like someone had delivered a present! After all, we'd paid for this months ago and now it was like it was being delivered for free, as if we hadn't foolishly squandered hundreds of Euros on it. I'm not quite sure why the UPS driver was so coy about the contents of the box. 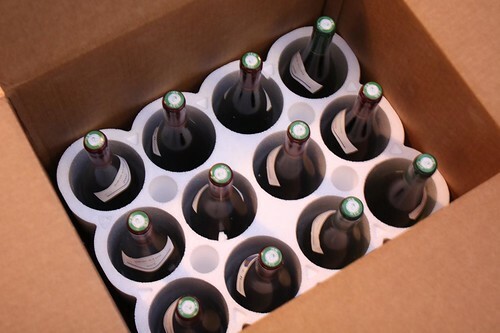 Is it illegal to ship wine via UPS? Is my favorite UPS driver in cahoots with the fast-talking wine salespeople in Beaune, France? Will we be able to fit 30 people in our tiny apartment for Canadian Thanksgiving? Answers to these questions and more on the next exciting installment of Jen and Nate Buy the Farm . . . Share!